Making direct contacts between students in the UK and at Sparrow is at the heart of Sparrow Schools Foundation’s work. Many schools have been involved in these links and the ability of the young people to empathise and learn through volunteering, tours and fundraising has been proved again and again. 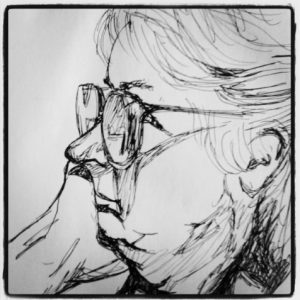 Sparrow Art Circle was founded by Melanie Heneke Eliot in early 2004 in the long tradition of women’s making circles. Inspiration came from a dear friend in Melanie’s homeland of South Africa, whose circle had met regularly over many years to create wonderful, collectible dolls. 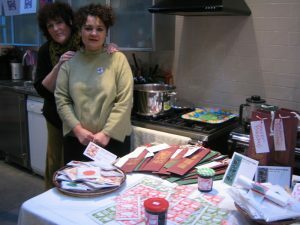 Their sale had raised substantial sums for children’s charities.Each Friday morning the Circle gathered in Melanie’s kitchen. The group aimed to re-discover and develop artistic skills through mutual support and advice and in this convivial atmosphere (and over a lot of coffee) various strengths emerged, ranging from painting on fabric, watercolour, drawing, and print-making to knitting, baking and container planting. Members worked individually and on Circle projects to produce work which was sold (together with beadwork from the Sparrow Job Creation scheme) in aid of Sparrow Schools. Where possible, recycled, collected and donated materials were used. 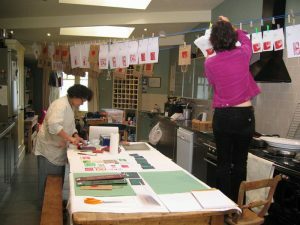 The artists were supported by friends and family who contributed craft work from far away as South Africa and Australia and tirelessly wove drying lines all over the kitchen to cope with the increasing output of the printmakers! Melanie’s work had a particularly South African charm and helped a great deal in communicating the work of Sparrow. She also took great pleasure in the direct contact she had with the young people when they joined her for a printing workshop during their 2004 choir tour. The children spent a morning designing, cutting and printing individual Christmas cards to take with them as a souvenir from the Art Circle back to South Africa. The Art Circle continued for several years and, remarkably, raised over £10,000. A number of prints remain on Sparrow Schools’ walls as a cheerful reminder of the special contribution made by the group. The circle also designed ten striking programme covers for Sparrow’s Celebration of Christmas. These were based on designs in the Art Circle archive and new work specially created for the cover by Melanie, Karin Hackett and Lois McDonald. Very sadly Melanie and Lois died in July of this year and Sparrow Schools and Sparrow Schools Foundation would like to express their sympathy to their families and to pay tribute to the contribution they and the Art Circle made to the lives of South African children. In August last year Alwyn Laudat Wade and Kenny Mukendi, who graduated from Morpeth School this summer, returned to Sparrow to help imbed the Drumworks programme introduced on earlier visits. Alwyn and Kenny spent two weeks running workshops with learners and teachers. They held 30 minute crash courses, selecting learners that showed potential and interest with the assistance of their teachers who made approvals based on behaviour. They also had workshops with the music teachers responsible for carrying the programme through once they had left. The introduction of the modern pan and rubber stick art was received with great enthusiasm by the Sparrow teachers aware of the benefits. “The learner’s progress in key areas such as memory, cognitive function, motor skills and social skills like self-discipline is already noticeable” Tristan Paton, Head Psychologist, Sparrow therapy team. Tudor Hall started an annual Sparrow School visit four years ago as part of their Tudor in Three Continents initiative, promoting a culture of involvement and giving back whilst exposing the girls to the world. The girls spent time at Foundation School both as teachers’ assistants and painting snakes and ladders and hopscotch in the playground and bright murals in one of the therapy rooms. Rani Tandon, the Deputy Head at Tudor Hall carried out teacher’s evaluation and training throughout the week, assisting the educators in implementing practical remedial teaching methods.